December 2010 In 1963, Miles Davis was at a transitional point in his career, without a regular group and wondering what his future musical direction would be. At the time he recorded the music heard on this disc, he was in the process of forming a new band, as can be seen from the personnel: tenor saxophonist George Coleman, Victor Feldman (who turned down the job) and Herbie Hancock on pianos, bassist Ron Carter, and Frank Butler and Tony Williams on drums. Recorded at two separate sessions, this set is highlighted by the classic "Seven Steps To Heaven," "Joshua" and slow passionate versions of "Basin Street Blues" and "Baby Won't You Please Come Home." 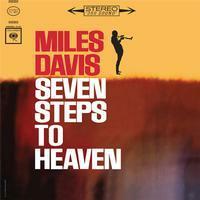 Seven Steps to Heaven finds Miles Davis standing yet again on the fault line between stylistic epochs. In early 1963, pianist Wynton Kelly, bassist Paul Chambers, and drummer Jimmy Cobb left to form their own trio, and Davis was forced to form a new band, which included Memphis tenor player George Coleman and bassist Ron Carter. When Davis next entered the studio in Hollywood, he added local drummer Frank Butler and British studio ace Victor Feldman, who ultimately decided not to go on the road with Davis. It's easy to see why Davis liked Feldman, who contributed the dancing title tune and "Joshua" to the session. On three mellifluous standards -- particularly a cerebral "Basin Street Blues" and a broken-hearted "I Fall in Love Too Easily" -- the pianist plays with an elegant, refined touch, and the kind of rarefied voicings that suggest Ahmad Jamal. Davis responds with some of his most introspective, romantic ballad playing. When Davis returned to New York he finally succeeded in spiriting away a brilliantly gifted 17-year-old drummer from Jackie McLean: Tony Williams. On the title tune you can already hear the difference, as his crisp, driving cymbal beat and jittery, aggressive syncopations propel Davis into the upper reaches of his horn. On "So Near, So Far" the drummer combines with Carter and new pianist Herbie Hancock to expand on a light Afro-Cuban beat with a series of telepathic changes in tempo, texture, and dynamics. Meanwhile, Feldman's "Joshua" (with its overtones of "So What" and "All Blues") portends the kind of expressive variations on the basic 4/4 pulse that would become the band's trademark, as Davis and Coleman ascend into bebop heaven.